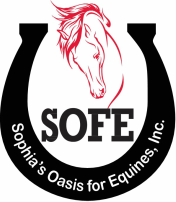 ﻿"Sophia’s Oasis For Equines, Inc. (SOFE), is a 501(c)3 Non-Profit, equine welfare organization located in the State of Maryland. We are dedicated to the rescue, rehabilitation and placement of equines in need; assisting equines in situations of neglect, abuse or the threat of slaughter. We are also dedicated to assisting other equine rescue organizations located in the tri-state area, New Jersey and Delaware to save equines from the slaughter pipeline. Additionally, we desire to help the BLM mustangs whenever possible. 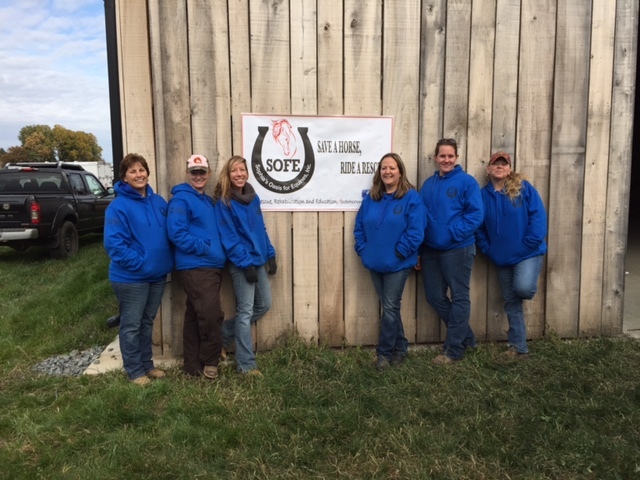 We are dedicated to educating the public regarding the standards of care required to maintain an equine as a riding partner and/or companion animal in a humane manner." (6) To provide all animals under our care with a comfortable and dignified existence without pain or suffering. If and when physical and medical circumstances no longer allow that comfortable life; to let them go gently and kindly with a humane veterinary-assisted euthanasia. (7) Provide sponsorships and assist other legitimate nonprofit rescue organizations when our facility is at capacity. Take responsibility for horse ownership!! Print the brochures below.Maryland Horse Council's Brochure, "If Only Love Was Enough"
These terms as applied to horses are defined herein. The Maryland Horse Council considers these guidelines to be the minimum standards of care for horses in the Maryland Equestrian Community. Nutritious food in sufficient quality (e.g. wholesome, palatable and free from contamination, such as feces, mold, mildew, insects, etc.). Food shall be provided in sufficient quantity and be of adequate and appropriate nutritive value. Diet shall be prepared with consideration for the age, breed/type, condition, size, work level and quantity of equine(s). Equines should score, by a veterinarian, no less than a body condition score 3 on theHenneke Condition Scoring Chart to be considered of adequate weight. Equines shall have access to adequate natural forage or be fed daily or as recommended by a veterinarian. All storage and feeding receptacles shall be kept clean and free from contaminants, such as feces, mold, mildew, insects, ...etc. If more than one animal is fed at one time or in one place, it shall be the responsibility of the owner/custodian to ensure that each animal receives nutrition in sufficient quantity. An equine shall be afforded immediate veterinary care if known or suspected to have an injury, accidental or deliberate, or exhibiting such signs as shock, colic, founder, tremors, swelling, broken bones, open wounds, inability to eat or drink, blistering as a result of fire, acid, etc., irregular or abnormal breathing, partial or total paralysis, abnormal discharge or bleeding, signs of disease, severe parasitic infestation or infection, loss of appetite, weight loss, abnormal skin condition or hair loss, temperature fluctuation, persistent diarrhea, inability to bear weight on a limb or lameness, or other such sign. Hoof care maintenance and trimming every six (6) to eight (8) weeks, or as directed by a veterinarian or a farrier. Parasites kept under control through worming every six (6) to eight (8) weeks or as directed by your veterinarian. Annual dental check-up and necessary treatment to ensure proper and adequate food digestion. Vaccinations as recommended by your veterinarian. Proper drink shall mean clean, potable water available at all times for all equines. Exceptions shall be determined by veterinary consultation or professionally accepted practices for the safety and well-being of the equine. Equines that are being worked or are in transport shall be provided water as often as necessary for the health and comfort of the equine. Frequency of watering shall consider age, breed/type, condition, size and quantity of equine(s). Activity levels and climatic conditions. Equines that do not have free access to water, must be offered water at least twice daily. All water receptacles shall be kept clean and free of contaminants and be positioned or affixed to minimize spillage. Enclosed areas should be constructed or modified to allow free flow of air to control temperature, humidity and prevent air stagnation. Space available to the equine must be usable and safe (e.g. must be provided an area free from standing water, accumulated waste, sharp objects and debris and maintained in a safe and healthful manner). Fencing shall be well maintained and in good repair at all times. Equines shall be allowed to exercise and have freedom of movement as necessary to reduce stress and maintain good physical condition. Space and provisions for exercise must be appropriate and sufficient for the age, breed/type, quantity, condition and size of the equine(s). Shelter for equines shall have at least a roof and three sides and be kept in good repair and free of standing water, accumulated waste, sharp objects and debris. Proper shelter provides protection from inclement weather conditions (e.g. prevailing wind, sleet, rain and temperature extremes). It is the responsibility of the owner/custodian to ensure that each equine, taking into consideration age, breed/type, and health, has access to proper shelter or protection from the weather (e.g. relief from more dominant equines that may exclude him/her from the shelter). All equines should have access to proper / appropriate shelter from weather extremes. Trees and natural weather barriers providing shelter may be considered adequate shelter. The Maryland Horse Council is an umbrella organization representing Maryland horse associations for the protection and promotion of horses and the horse industry. In the State of Maryland you would report suspected cases of abuse or neglect to your local animal control organization or humane society for the county in which the horse is located. In other states the procedure may be the same or you may have to contact a local law enforcement agency such as the police or sheriff. What information is needed to investigate equine abuse/neglect? The address or clear description of where the equine is located. A description of the abuse/neglect and who witnessed it. A description of the horse(s) involved (size, breed, color, markings). While it may not be necessary, the investigator may ask for your name, address and telephone number if a warrant will be needed to enter a barn in order to view the horse, the investigator has quesitons about how to find the horse, or the investigator wants to ask you to monitor the situation in the future. For equine cruelty investigations to be effective and hopefully remedy the situation, your help and cooperation are imperative. "Save A Horse, Ride A Rescue"